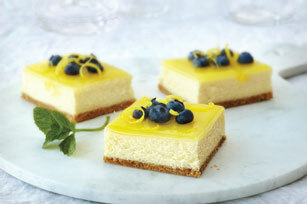 These tangy-sweet squares are a marriage of two classic desserts--lemon bars and cheesecake. A luscious lemon glaze is the perfect finishing touch. Line 13x9-inch pan with foil, with ends of foil extending over sides. Mix wafer crumbs and butter until blended; press onto bottom of prepared pan. Bake 10 min. Separate 1 egg; refrigerate yolk until ready to use. Beat cream cheese, 1 cup sugar, flour, lemon zest, 2 Tbsp. lemon juice and vanilla in large bowl with mixer until blended. Add egg white and remaining 3 whole eggs, 1 at a time, mixing on low speed after each just until blended. Pour over crust. Mix corn starch and remaining sugar in medium saucepan; gradually stir in water and remaining lemon juice until blended. Bring just to boil on medium heat, stirring constantly; cook and stir until clear and thickened. Lightly beat reserved egg yolk in small bowl with fork until blended; stir in 2 Tbsp. of the hot corn starch mixture. Return to remaining corn starch mixture in saucepan; stir until blended. Cook 1 min. or until thickened, stirring constantly. Cool slightly. Spoon lemon glaze over cheesecake. Refrigerate 1 hour or until firm. Using foil handles to remove cheesecake from pan before cutting to serve. Garnish with 1/2 cup blueberries, lemon peel and fresh mint leaves just before serving. This lemon glaze can be prepared ahead of time. Cool, then refrigerate up to 8 hours before spooning over individual slices of cheesecake.